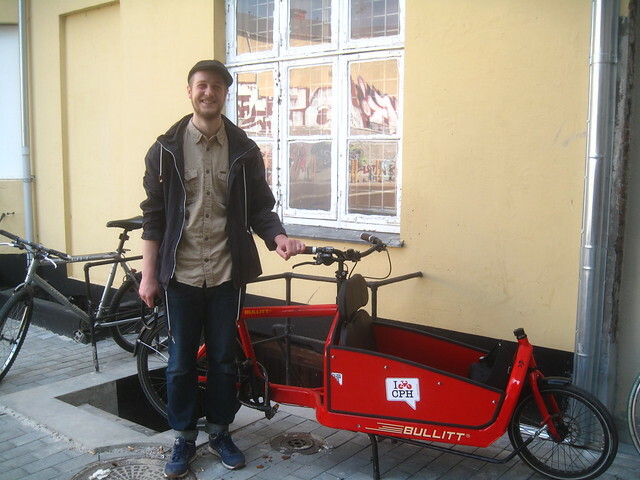 Copenhagenize.com - Bicycle Urbanism by Design: My Bullitt is Found!!! Unbelievable. Absolutely unbelievable. 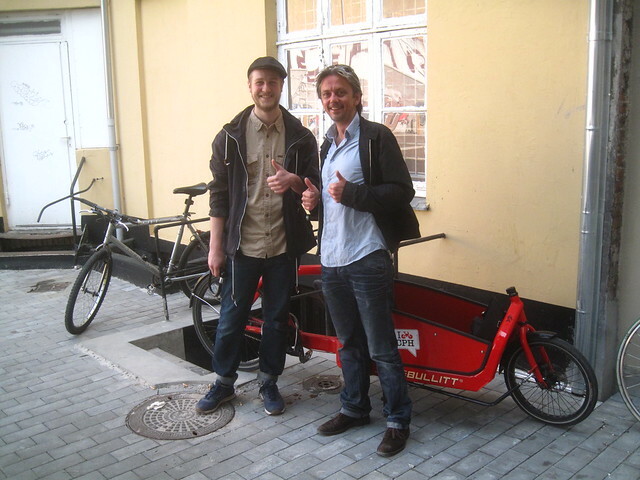 I recieved a text message from Christian (at left, above) saying that he had spotted my red stolen Bullitt in his backyard in the Nørrebro neighbourhood. I called him instantly. (I mean INSTANTLY) and we went over the details on the bike. There was no question it was The Missing Bullitt. My friend Andreas and I hopped onto our bikes and flew off from Copenhagenize Consulting's offices in the centre of Copenhagen to meet up with Christian. Sure enough, there it was. My primary means of transport. Not locked to anything, with just a cheap wire lock through the wheel and frame. Christian had locked it with his own lock to the railing, just in case. The guy who nicked it peeled a few of the stickers off - the Bike Portland ones, the Cycle Chic one, but left the main stickers on the sides intact. DUH! The little seat where my daughter sits on the crossbar was gone, as was the wheel lock, but that's about it. Almost completely as I last saw it. As fate would have it, it was in a backyard only 75 metres from Larry vs Harry's workshop so I just lifted the back wheel and took it there. Borrowed some tools and cut the lock. Freedom! Liberation! A2Bism Revisited! I promptly threw Christian in the box and we rode to the nearest supermarket. 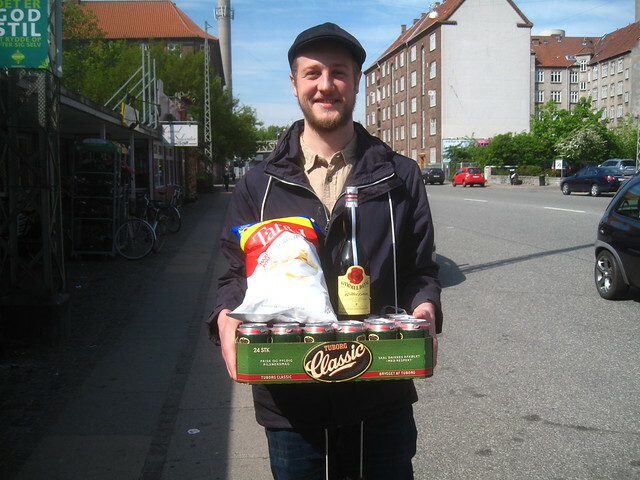 Rewarding him with the traditional Danish summer menu: A case of Tuborg Classic, some potato chips and a bottle of Gammel Dansk. THIS is what social media is for. THAT'S why we we're here. THAT'S why we came. 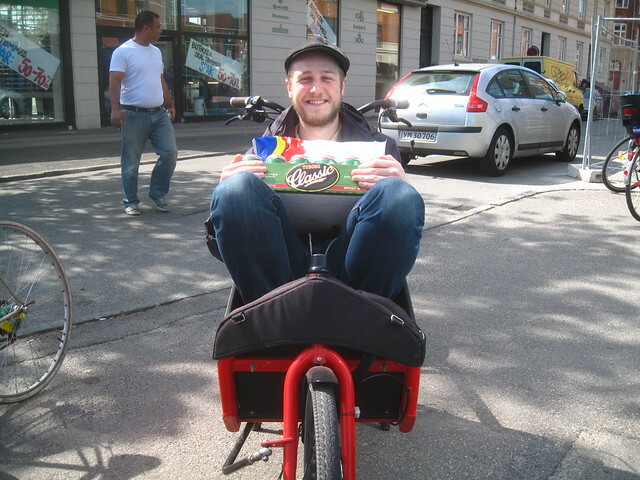 I would like to thank everyone who has been on the lookout for the bike in Copenhagen. 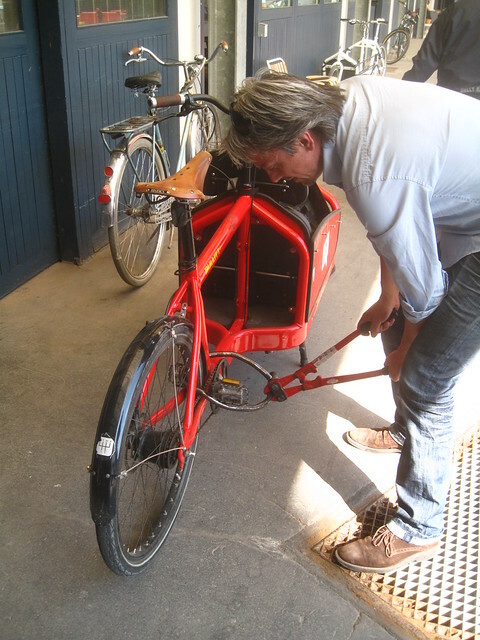 Thanks to Thue who posted about it on the Fixie King website here in Copenhagen, which is where Christian saw it. Get Christian to give you one of the beers and a shot of Gammel Dansk. Thanks also to Treehugger and Bike Portland who wrote about it on their sites. And all the retweets and facebook sharing.